Hotel Golden is the best budget hotel in Haridwar. Hotel has defined a benchmark of fine living and has expressed high standards in the art of hospitality in Haridwar. It has retained the spirit and charm of the traditions of India and has blended these with the latest technology that the industry has to offer. Ideally located & 2 mins walking distance from railway station & bus stand. Harki Pauri & other local site seeings are just a km away. 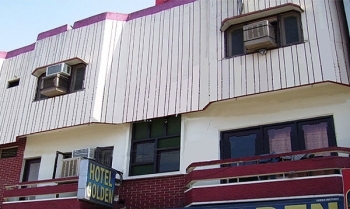 Hotel Golden is located adjacent to Ganga Ghat at Kankhal Road near Shiv Murti. The Hotel Golden boasts of its beautiful location and nice surroundings. Railway Station is just 500 meters stroll from the hotel. The famous Har Ki Pauri is 1 km from Golden hotel in Haridwar. The hote is 38 Km from Jolly grant Airport NH 58 and 500 Mtr Distance from Mansa Devi Temple. The Hotel Gloden has 17 tastefully furnished rooms. They have attached bathrooms, with modern fittings and arrangements. The design and decor of these rooms are eye-catching. The rooms have beautiful upholstery, bedcovers, cushions and spreads, all showing class and style. By Air : The airport of Dehradun is the nearest from Haridwar. It is known by the name of Jolly Grant Airport and is located approximately 35 km away from the hotel Golden. By Rail : Haridwar has a railway station of its own, connected with all the major cities of India. Many trains coming from Delhi, Mumbai, Varanasi, Kolkata, etc halt here and bring in the large rush of visitors who come to take a bath in the waters of the holy Ganges. There are a large number of trains available for reaching Haridwar from New Delhi, with the ones to Dehradun also making a stoppage here. By Road : Haridwar, with it good road network, is easily accessible from the key cities in India. The city is around 215 km from New Delhi and since the National Highway passes through it, reaching there by road is not at all a problem. Buses and taxis are easily available to and from the major cities like Delhi, Dehradun, Agra, Lucknow, Jaipur, etc.